Classic or contemporary? Shop seasonal style online and in store, or order something bespoke. Home for Christmas? Gardenia offers a professional home decoration service and we welcome bespoke commissions. Where will you be for Christmas this year? For me and mine, Christmas will be as it always is – an early morning stocking session, a crisp walk to our local for a glass of fizz with friends, then back home to eat, drink some more, and hunker down in front of the fire. 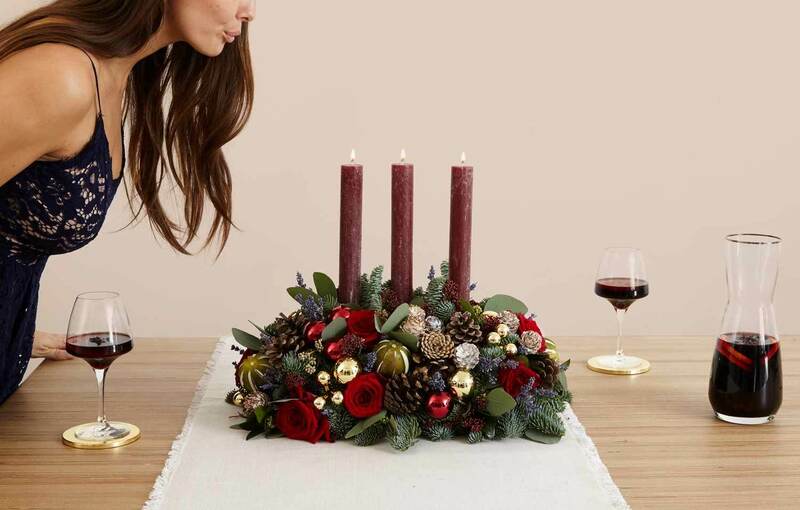 Inevitably, I’ll be asleep as soon as my bottom hits the sofa – the result of the eight-week frenzy that defines the florist’s festive season. Key to all that is the most important of Christmas words – home. ‘Home’ might be your own house, or it might be someone else’s house this year. It might be a chalet in the mountains (lucky you!) or it might simply be the people you choose to spend this time with. Whatever yours looks like, home is what it’s all about – and that’s why I’m particularly proud of our Christmas range this year. It’s a celebration of being with the things and the people that you love – a collection that will make your home even prettier, even cosier and even more joyful. It’s that warm-and-fuzzy, home-for-Christmas feeling wrapped up with a Gardenia bow. So gather your ilex, hang up your wreath and decorate your tree. Welcome home. Supreme quality Nordmann Fir Christmas trees, hand-finished wreaths, candlelit table centrepieces and bundles of festive foliage. Join us at a local eatery for a Wreath Workshop this winter. The Gardenia girls will show you how to make your own Christmas wreath, with drinks and nibbles served whilst you work. A limited number of Christmas tree home delivery slots is available to customers in South West London. Book early to avoid disappointment.